Spending an evening in a hammock, counting the calls made by frogs, seemed like an easy way to do a biological survey. The only problem was that it forced us to listen to the jungle. The blackness was bearable when we couldn't hear it. With headphones on and music playing at sufficient volume to drown out any sound from the surrounding world, I could have spent a very contented night in that hammock. Unfortunately, when listening to the frogs, it was impossible not to notice all of the other noises of the night. Scuffles. Scratches. Creaks. Grunts. An occasional muted scream. I am not afraid of the dark, I told myself. I'm afraid of the things that are afraid of the light. Big cats, for example. Thus I lay with my torch clutched to my chest like a weapon, firing shafts of yellow light in the direction of any unexpected sound. The light always shone blankly on brown leaves and tree trunks. Whatever had made the sound would sublime into the shadows the instant I flicked the switch. It was absurd now to reflect that, as a young child in a suburban English house, I had worried about monsters in my bedroom. I don't think I ever seriously believed in the monsters' existence, but the mere mental image was enough to make me wrap myself nervously in bed sheets, concealing my presence from them. It was even more unbelievable to find myself entertaining the same nightmares twenty years later, as a biology student in the depths of Central America. Like in Maurice Sendak's fantastical children's story, my dreams had somehow carried me away, across the ocean to the Land Where The Wild Things Are. And here there really might be monsters under my bed. As an adult I reacted to the danger in the same way as a three year-old, covering my head with my blanket in the comfortable belief that this would protect me from whatever was out there. Most of the noises were undoubtedly harmless. Falling nuts, scurrying rodents and roosting birds adjusting their position in the trees all contributed to the pitter-patter of the forest. After the first few hours I had accustomed myself to the smaller sounds, and the pictures in my mind of carnivorous beasts had been replaced with a mental animation of cute little mice weaving trails through the leaf litter. The roaring of large animals was harder to ignore. It was just after midnight on the first evening that this began: a deep, sinister sound that rose and fell like a yawning howl. The creature making it was clearly some distance away, but it was getting louder. In the opposite direction, a second individual began to roar. The two animals slowly circled us, one on each side, drawing invisibly closer. When the roaring stopped, it only made matters worse. Whatever had made the sound was still out there, and now we had no idea where. At this point every raindrop and falling leaf became a predatory footfall. I had often wondered how nocturnal hunters manage to move in silence through a crunchy forest. That night, I realised that they don't need to. They simply need to blend in with their background. Deprived of any sense but our hearing, we lay helplessly in the centre of a black void prickled by tiny sounds, and prayed that we would be spared until dawn. Nothing emerged from the darkness, and the next morning, the sonorous horrors of the previous night evaporated in the sun. "Howler monkey," said the assistant at the research station nonchalantly, upon hearing of our experience. Of course it was. By daylight it was obvious that the roaring had come not from marauding predators - those would have stalked us without a sound - but from our furry cousins in the treetops. Armed with this knowledge, we looked forward to a better experience in the forest on subsequent evenings. However, each new night brought new noises, scary noises that we couldn't explain. And the roar of a howler monkey in the dark remains chilling, even when you know what it is. Human beings are creatures of daylight and open spaces, and we could never completely dispel our fear of the jungle. On the final night of the survey, I made the mistake of allowing myself to fall asleep in between counting frogs. I dreamt that I had encountered the ghosts of two biologists walking through a grey mist in the forest. "Come over here," I called into the mist. "We can't," they replied, in timorous, ethereal voices. "We'll show you," they replied. At this point, in real life, there came a ferocious crashing noise from between the trees nearby. 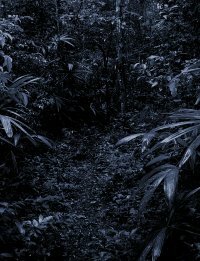 Wide awake and shaking, I sprang up onto my elbows - nearly inverting the hammock - and flung torchlight at the source of the sound. I saw nothing but the shadows between the tree trunks.